Whitman had read an early version of the poem at the famous Pfaff's and one of those in attendance, Henry Clapp, secured its publication. Though one reviewer called it "hopeless drivel," many scholars today consider the poem one of Whitman's best. The poem offers somewhat of a narrative: the speaker remembers a time on the beach in his boyhood when he sees two birds which soon fly away; one never returns. Many have seen the poem as describing the birth of a poet, particularly as it opens with a cradle, before culminating in a profound grasp of nature and death. The poem, then, explores both a beginning and an ending. 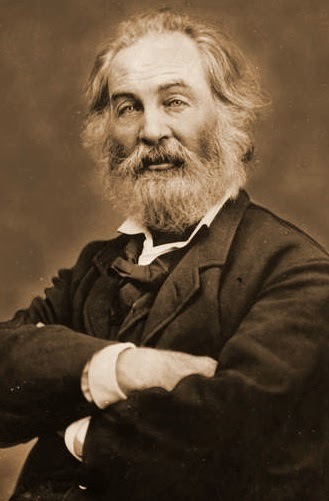 "Pains and joys," Whitman says he has since explored, "here and hereafter." My American literature professor as an undergraduate, Dr. Joseph Zaitchik, once told me that the opening lines of this poem represented the best-sounding line in American poetry. "Out of the cradle, endlessly rocking" has a certain cadence, a rising and falling, a harshness with "k" and "g" sounds, along with more sonorous "o" and "s" sounds. Those sounds, perhaps, represent the same ups and downs, opposing ideas of beginning and ending, in the poem itself. With this post, I have officially posted 1,000 articles of new content, all exploring various aspects of American literary history (mostly in the 19th century). 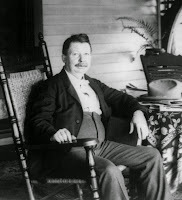 I have had the great opportunity of rediscovering forgotten writers, of enthusiastically promoting some of the greatest, and sharing it all with you, the readers of the American Literary Blog, since my first post in December 2009. I dedicate the entirety of this project to Dr. Zaitchik, who first inspired me to love American literature. Which I do not forget. Riley and Garland: Dont y' Darst! There is some talk here of your going abroad as a consul — but dont y' do it. Dont y' Darst! You've got a bigger mission than t'go to any dam ol' forin port. You'll be like Bret Harte git fat an' forget what y'r country looks like — an you'll fergit the "County Ditch" an' Kingry's Mil an' all them thare things we like t' hear about. Sence them boyhood-days o' mine—! All the old landmarks o' town. Where's the Tanyard? Where's the Still? Tell me where's old Kingry's Mill? The blame' cars now crosses there! It jest knowed we'd stol'd the skiff! That old chap, with all his cheer—? Right out o' the wagon-bed! What did he keer where we went—? And that's all I ast!" says-ee. Soothin' to a feller's hand! Even jest to think of it—! On the worter roarin' so! Down around old Kingry's Mill! Daniel L. Dawson was born in Lewiston, Pennsylvania on December 17, 1856. 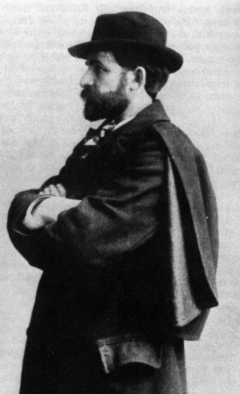 As an adult, he began contributing original poems to the Philadelphia-based Lippincott's Magazine; these contributions were eventually collected in The Seeker in the Marshes; and Other Poems (1893). Julian Hawthorne, son of Nathaniel, effused praise for the book, calling Dawson "one of the truest, most inevitable poets of this age. His poems are intensely lyrical and of permanent worth." He further compared him to Walt Whitman. Much of his writing reflected his interest in mythology and folklore — to the chagrin of one reviewer for the Methodist Review, who accused Dawson of paganism and that paganism, in turn, was "fatal" to the creating of literature. The reviewer noted that the poet "had been intimate with various heathen divinities of doubtful reputation; but we judge from his poetry that he did not know Christ even when he saw him." 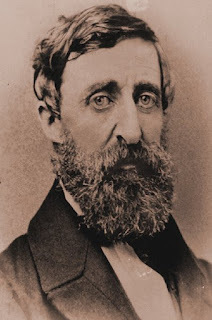 Further, he said, if Dawson, a perpetual bachelor, was in any way comparable to Whitman, it was because both men had a similar "animality, not so healthy and well-kept." I will say some things for the ears of men. And cloud the life in a red eclipse. But the price we pay for this is—hope. Though I know to-morrow is only to-day. And now, reader and friend, our hour of pleasant gossip is finished. We have said nothing of the pictured rocks, or the great western caverns, nor wandered together in spirit on the borders of our mighty lakes, or the shores of the " father of waters." And pleasant dreams, and slumbers light." O'er vale and mountain steep. In window, or in wall. Mrs. Partington says that the price of bread may have advanced, but that she never pays more than fifty cents for half a dollar's worth. These short, witty "epitaphs," often inspired by current events or concerns, became his hallmark. After several years working with Mrs. Partington at the Boston Post, Shillaber and Charles G. Halpine established their own humorous magazine, Carpet Bag, in 1852. Shillaber himself admitted the magazine "had more character than patronage" and it "died happily" about a year later. 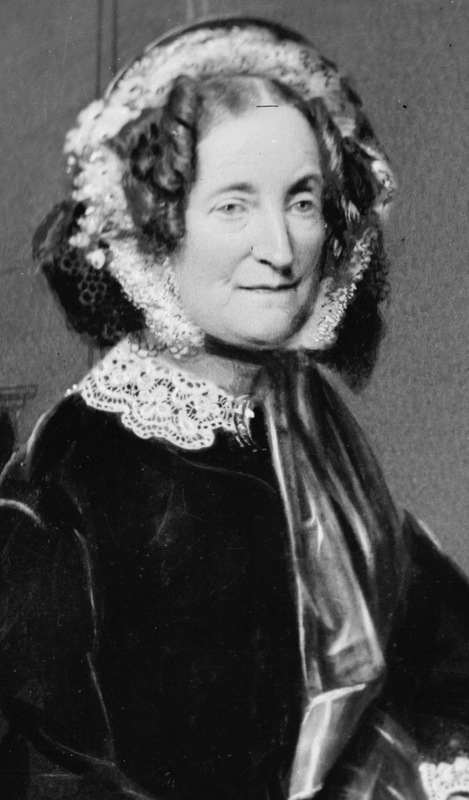 He took the opportunity, however, to publish a book, Life and Sayings of Mrs. Partington in 1854. 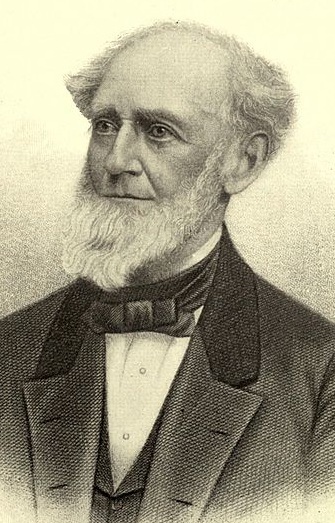 By 1866, he was mostly retired and spent the rest of his life just outside Boston. 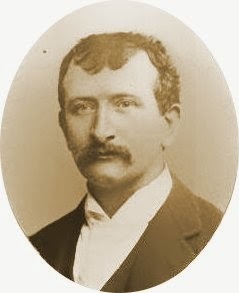 Upon his death in 1890, newspapers reported of his unending cheerfulness, much like his work, and predicted that his Mrs. Partington character "will doubtless ever remain a unique figure in American humour." What kin is that which all Yankees love to recognize, and which always has sweet associations connected with it? Why, pump-kin, to be sure. "Hand me my pantaloons, if you please." These were the last recorded words of Connecticut-born poet Fitz-Greene Halleck before his death 147 years ago today on November 19, 1867. "I want to go away." "All is perfect peace with me." "Take me away. Take me away." "Your kisses are always sweet to me." "In spite of it all, I am going to sleep; put out the lights." I have delayed answering your letter hoping to see my way clear to accepting the invitation which you were kind enough to send me, and which I assure you is very highly appreciated. Though I have been away so many years, I still feel that Eatonton is my home and the people there my best friends. I love them all, so much so that I have never written anything to be published in book form that I did not ask myself if there could be anything in it which my friends there would not approve. Thus, in a way, they have been my most helpful critics. I thank you heartily for the invitation and regret that a pressure of work will prevent me from accepting. 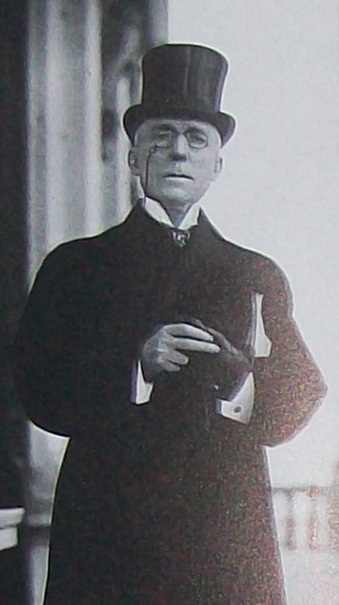 Harris was then working on what would become Gabriel Tolliver, a book which he dedicated to his friend James Whitcomb Riley. He also admitted to Riley that he had allowed the interest of his characters to overshadow the story. Even so, the book was set in Shady Dale, a fictionalized version of Eatonton, which served as an equally important character in Harris's writings. The book begins not unlike the invitation he received in 1901: "Cephas! here is a letter for you, and it is from Shady Dale! I know you will be happy now." 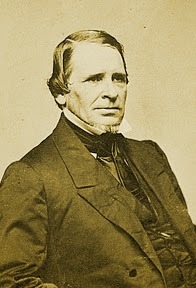 The narrative voice then admits that he far too often spoke of the town of his youth, that his recollections of Shady Dale were "coloured" and that he saw the people only through his "boyhood-eyes." The other character in that opening, Sophia, warns Cephas that if he were to go back, he'd learn they weren't so different from everyone else after all. "This was absurd, of course—or, rather, it would have been absurd for any one else to make the suggestion; for at that particular time, Sophia was a trifle jealous of Shady Dale and its people." But to set forth its origin is not to describe its beauty, which is of a character that refuses to submit to description... You are inevitably impressed with a sense of the attractiveness of the place; you fall under the spell of the old town... And yet if you were called upon to define the nature of the spell, what could you say? What name could you give to the tremulous beauty that hovers about and around the place, when the fresh green leaves of the great trees are fluttering in the cool wind, and everything is touched and illumined by the tender colours of spring? Under what heading in the catalogue of things would you place the vivid richness which animates the town and the landscape all around when the summer is at its height? And how could you describe the harmony that time has brought about between the fine, old houses and the setting in which they are grouped? All these things are elusive; they make themselves keenly felt, but they do not lend themselves to analysis.